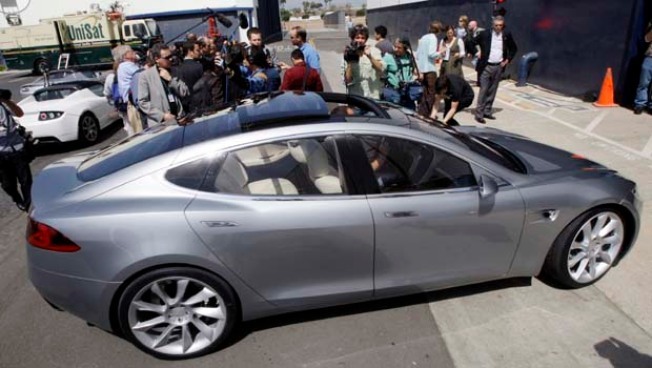 The prototype Tesla Model S all-electric 5-door sedan is driven past journalists after its unveiling in Hawthorne, Calif., Thursday, March 26, 2009. Tesla Motors is recalling more than half of its new $109,000 electric Roadster sedans to address a problem with the vehicle's steering, the automaker said Thursday. The San Carlos automaker said the recall will fix rear bolts that were improperly assembled by Lotus, the contract manufacturer of the Roadster chassis. And yes, they will make house calls. The recall affects 345 Roadsters from the 2008 model year assesmbled between March 2008 and April 2009. The electric car company has delivered nearly 500 Roadsters, spokeswoman Rachel Konrad said. The government said Lotus was recalling 27 Elise and Exige vehicles from the 2009 model year to address similar problems. A Tesla owner complained about poor steering around wide turns, leading the company to investigate. No injuries have been reported. Tesla said the car's electric powertrain was not affected by the recall. The company plans to send technicians to owners' homes to tighten the bolts and provide a full inspection and software upgrade free of charge. Tesla, named for Nikola Tesla, a pioneer in developing efficient uses for electricity, was founded in 2003 with $40 million in venture capital from investors such as Google co-founders Larry Page and Sergey Brin.